8.65 points at 66 votes (rank 13). A story from times long ago tells us of the three-headed Morgul, who rules in his realm, isolated. This Morgul was the cause for all horrible nightmares that came to everyone in the galaxy from time to time. Additionally it needs to be said, that he had been banned to an unknown dimension at that time by a hero named Develon. From this point of time, there were no sleepless nights full of dread. Many epochs after that, everything was calm, but since some time the news about horrible dreams are brought along, getting more and more often. There's hardly anybody who dares to close his eyes and the inhabitants of the galaxy are close to death due to exhaustion. There is a terrible suspicion dawning and it gets more and more a certainty! Had Morgul managed to escape from his exile and returned to his realm? The full responsibility is on your shoulders. You are the only one who can face Morgul! You get equipped with weapons and defence items of the newest technology to have a small change at this mission. Your job is: Find Morgul and destroy him... for good! The game (for the C64) consists of 13 levels, which comprise altogether over 1300 screens. The first time on the C64: Parallax-scrolling into eight directions with 16 colours and 50 images per second and all that without flickering and lags. Additionally there is digisound (speech output) and many oversized intermediate / end bosses, 50 different "normal enemies", ten different weapon systems, and much more! The 13 levels of Turrican are pooled into 5 worlds. Three worlds have each three levels and the other two worlds have each two levels. 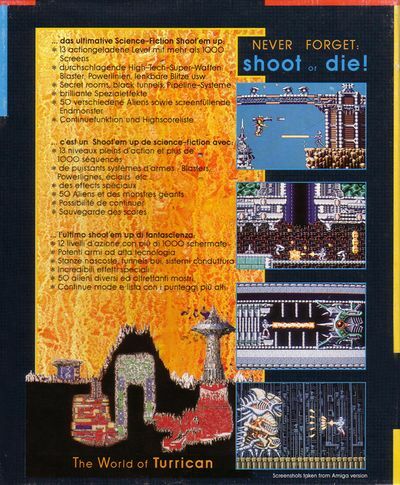 As arms you have at the beginning the "normal shot", several mines, the laser and a super weapon. All these weapons can be expanded by collecting bonus symbols. A special ability of the combat suit is, that it can change into a crunching rotary (3x per life). All levels contain many secret rooms where there are mostly extra symbols, extra lives and diamonds (per 300 diamonds 1 continue). However, you have only limited (but not very tight) time per level. 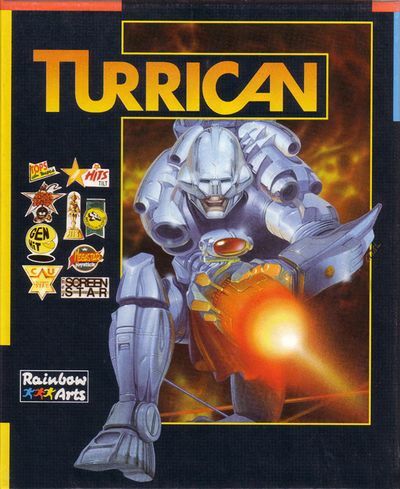 Turrican is mixture of Jump and Run, Action-Adventure and vertical Shoot'em Up (Level 3.1). The complete concept, i.e. 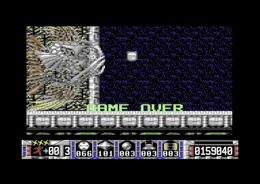 the graphical and technical design comes from Manfred Trenz, who is probably most well-known to every C64-freak through the game "Katakis" / "Denaris". The sound was added by Chris Hülsbeck, Ramiro Vaca and Stefan Hartwig, all of them true masters in their field. The F/X were done by Adam Bulka. You see, that for this project some of the greatest figures of the C64 epoch had joined together! Graphically a very good game, which also very much fun to play by the fair level build-up. A drawback is there: Unfortunately, there is no music in the Jump 'n' Run-levels, but therefore the sound effects are very successful. Joystick forwards: character jumps. If it is at that moment in the shape of the rotary, it will be changed back to the normal shape. + Joystick backward and fire button: With this a mine is activated. The mine is placed on the ground and explodes after a short time. Different enemies walking on the ground can be blasted away with this. + SPACE Joystick backward and SPACE: The character can be turned into a rotary. In this state it is invulnerable and can destroy its enemies by the sheer touch. The rotary rolls automatically and can be steered by joystick only to the left and right. In this state it is possible to go through narrow aisles. With every life, the character can change into a rotary 3x. keep fire button pressed: With this the character can activate and steer a bolt (as long as the button keeps pressed) by moving the joystick to the left + (bolt turns anti-clockwise) or right + (bolt turns clockwise). The bolt can have different lengths. At the beginning it is as long as half of the screen. By collecting extra symbols it can be enlarged to the size of the whole screen. press fire button shortly: character shoots. If a symbol for the scattershot or the laser has already been collected, the corresponding weapon is used. The scatter shot can be expanded in 2 levels by collecting symbols. In the first level (basic) the character shoots 9 horizontal shots. In the second step 3 fusillades are shot at the same time: 3 shots upwards in 30 degree angle, 3 shots horizontally and 3 shots downwards in a 30 degree angle. The third level is similar to the second, but changes between a 30 degree and a 45 degree angle. The laser is a horizontal shot, which can be enlarged, also by collection further corresponding symbols. Its length reaches from an eighths up to half of the width of the screen. The laser has a high vigour so it is rather effective against many enemies at the same time. Press SPACE : This way the character can activate two energy lines, which spread in full height of the screen to the left and right. All reachable enemies are destroyed. But if an obstacle is in the way, the line is stopped. Press F7 : The character throws a grenade. If it hits an obstacle or an end boss, it works like a smart bomb, i.e. all enemies that are on the screen at that moment are destroyed. On other enemies it works like a shot with high impact. Press CTRL : With this the pause mode is started. The game can be stopped for an unlimited time. You continue to play by pressing the fire button. Bright blue activates the shield. It gives the player invulnerability for a short time. Enemies can be destroyed by touching them during this time. Diamonds If the player has collected 300 of them, he will get another "CONTINUE", i.e. the possibility to start another try after all lives have been lost. 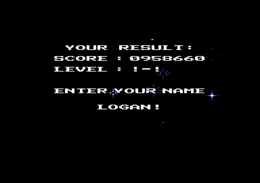 If a very high score was reached, you can enter your name into the ranking. After entering you name you need to press the RETURN key. Now a menu appears. If you now press the fire button of the joystick, the main menu will appear again. But when pressing S the request to insert side 1 appears. With RUN/STOP you return to the menu. By pressing the fire button' of the joystick on the other hand the new highscore is saved. With the CTRL key you activate the pause mode. If you keep the fire button pressed at the same time, the character can move freely without an enemy showing up. As long as you have both buttons pressed it stays that calm. The time goes on running but you don’t get any points. There are extra lives in level 1-1: In the last third, climb the big tower, place the character at the left rim and let it jump blindly into the depth (at the same time press the joystick to the left). You land safely in a tiny platform. Now let the character jump up a few times, wait a bit and then you have 4 lives more! Short and sweet: A must-have". Guybrush: "One of the ultimate games on the Commodore, cool graphics, cool sound, a clear 10!" Logan: "The level design is unique and not a sequence of graphic effects as in so many games. The sound is legendary and has been remixed very often. One can rightly claim that Turrican on the C64 is a work of art." 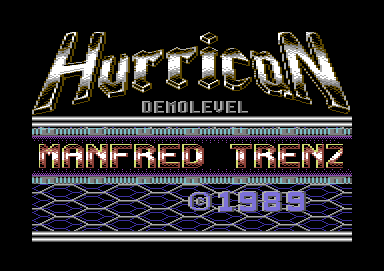 The first preview was released on the 64'er Special Edition Disk 01/90 under the name Hurrican and contained levels 1-2. On C64Games.de you find the D64- and TAP-image.